With Apple announcing the summer release of the new OS X Mountain Lion operating system, Mac users will be forgiven for being a little bit excited about the unexpected OS which makes a huge step towards the fusing of OS X and iOS. The newest Mac operating system builds on the current Lion offering, but adds additional features which Apple describe as “being inspired by the iPad, re-invented for the Mac”. For a lot of people, this is one of those catch twenty two situations. The fact that Apple have announced the new Mountain Lion operating system and have showed screenshots and videos of it in action will undoubtedly whet the appetites of Mac users who have been expecting a more iOS-like desktop offering from the Cupertino company. Although the summer is only a few months away, when waiting patiently for a release, it can seem like a life time, and not everyone has access to an official developer account to play with the developer release of Mountain Lion. So, what are the alternatives? Well, unfortunately Mountain Lion isn’t ready for prime time action just yet, so finding an installation method and using it as a main OS would be a fruitless task. But for those who appreciate the aesthetics of the new Mountain Lion operating system, the Dribbble design community may have something that will be of interest. Member Benjamin Crozat has released a theme for the popular Growl pop-up notification system which is used so extensively throughout the Mac experience. The theme, aptly named the ‘Mountain Lion Growl Theme’, basically hooks directly into the Growl applications and presents itself through the official Growl system preferences for activation. By selecting ‘Open Growl preferences’ and then ‘ Display’, users are presented with the ability to theme the pop-up notifications which are received, as well as set various properties of each theme such as display duration and notification opacity. 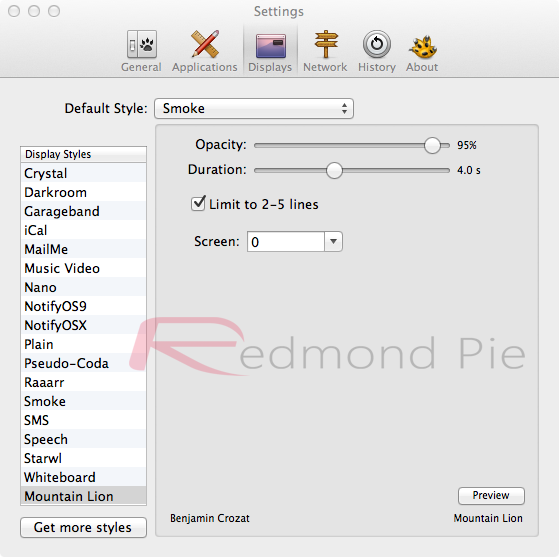 Crozat has offered his Mountain Lion theme as a free of charge download from his official Dribbble design page, which can be installed simply by extracting the growlStyle file from the compressed folder and double clicking to execute. If you crave the elegant look of Mountain Lion, but don’t have a Mac OS X developer account and can’t wait until the summer then download the Mountain Lion theme now and at least you will get a taste of Apple’s new OS every time a notification comes through.